Euthecodon brumpti was a large slender-snouted fish-eating crocodile, that was common in the lakes and rivers of Lake Turkana (Kenya) between 1 and 8 million years ago, during the Neogene. A particularly large specimen of this crocodile found at Lothagam on the west side of Lake Turkana dated to some 4 million years, was estimated to (as explained above) have been almost 10 meters (~33 feet) in length. Gryposuchus is an extinct genus of gavialoid crocodilian. It was also a slender-snouted crocodile-like Euthecodon. Fossils have been found from Argentina, Colombia, Venezuela, Brazil, and the Peruvian Amazon. The genus existed during the early and middle Miocene epoch. One recently described species, G. croizati, grew to an estimated length of 10 meters (33 feet). Deinosuchus was far larger than any modern crocodile or alligator, with the largest adults measuring 10.6 meters (35 feet) in total length, its overall appearance was fairly similar to its smaller relatives (today’s alligators). Deinosuchus was an apex predator and probably capable of killing and eating large dinosaurs. You can buy this poster on ebay. Rhamphosuchus was the number one, but not anymore: for many years scientists believed that it was one of the largest, if not the largest crocodylian that ever lived, reaching an estimated length of 15 to 18 meters (49 to 59 feet) and 20 tons in weight. 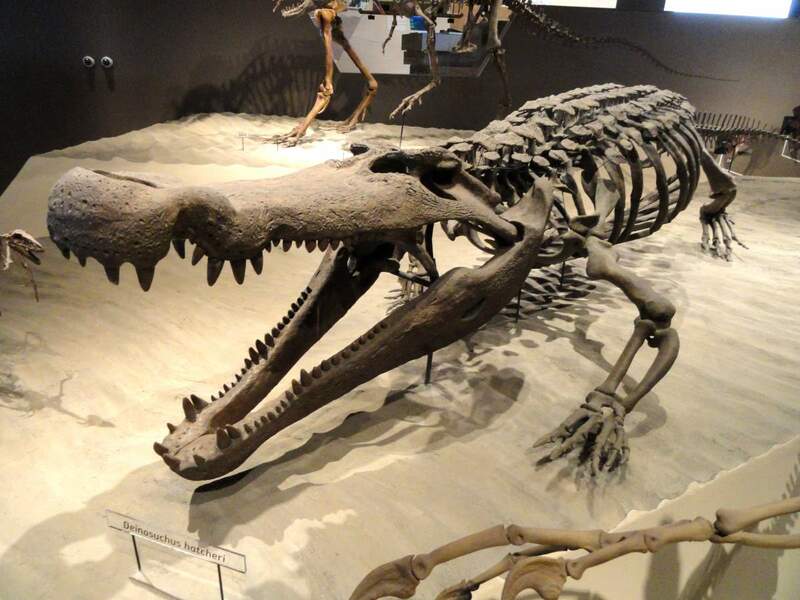 However, a more recent study suggests that the animal may have been 8-11 meters (26-36 feet) in length, and therefore is not the largest known crocodylian. Rhamphosuchus inhabited what is now the Indian sub-continent in the Miocene. It is only known from incomplete sets of fossils, mostly teeth and skulls. Mourasuchus is an extinct genus of giant crocodilian from the Miocene of South America. With an estimated length of up to twelve meters long,‭ ‬Mourasuchus was one of the biggest crocodiles of all time.‭ ‬However, despite this gigantic size, Mourasuchus had a relatively weak jaw and skull construction combined with quite small teeth for its size: the skull has been described as duck-like, being broad, flat and very elongate. ‬These two things do not portray an apex predator that wrestled large prey into the water. It presumably obtained its food by filter feeding; the jaws were too gracile for the animal to have captured larger prey. It also probed the bottoms of lakes and rivers for food. 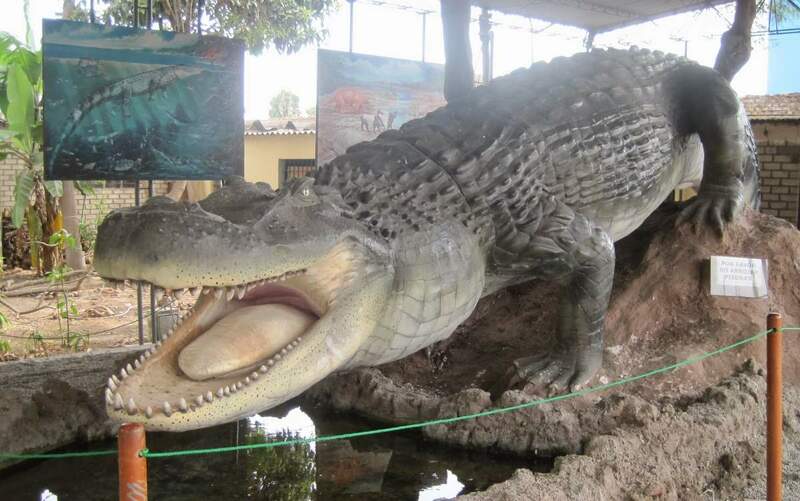 Fossils have been found in the Fitzcarrald Arch of Peru, where it coexisted with many other crocodilians, including the giant gharial, Gryposuchus, and the alligatorid Purussaurus. The great diversity of crocodylomorphs in this Miocene-age (Tortonian stage, 8 million years ago). Winner? Which was the largest prehistoric crocodile? Number two and one are controversial. So I didn’t give numbers at the top two monsters. In fact, Sarcosuchus, Purussaurus, Deinosuchus, and Rhamphosuchus had similar body sizes. Sarcosuchus and Deinosuchus had similar proportions, but both were geologically much older, dating from the Early and Late Cretaceous, respectively. Rhamphosuchus lived around the same time as Purussaurus, but was slightly smaller, had a more gharial-like snout and lived in India. Purussaurus was actually a caiman(1). It has lived in South America during the Miocene epoch, 8 million years ago. It is known from skull material found in the Brazilian, Colombian and Peruvian Amazonia, and northern Venezuela. Purussaurus is one of the largest known crocodyliformes ever to have existed. ‬Body length estimated between‭ ‬11‭ ‬and‭ ‬12.5 ‬meters (~36 – 41 feet). The estimated skull length for one large individual of the type species P. brasiliensis is 1,400 millimeters (55 in). Paleontologists estimate that P. brasiliensis reached around 12.5 meters (41 feet) in length, weighing around 8.4 metric tons, with a mean daily food intake of 40.6 kg. Bite force has been estimated to be around 69,000 N (around 7 metric tons-force). This is really a massive force because today’s “winners” -saltwater crocodiles- slammed their jaws shut with “only” 16,460 N of bite force. The large size and estimated strength of this animal appear to have allowed it to include a wide range of prey in its diet, making it an apex predator in its ecosystem. As an adult, it would have preyed upon large to very large vertebrates with no real competition from sympatric, smaller, carnivores. 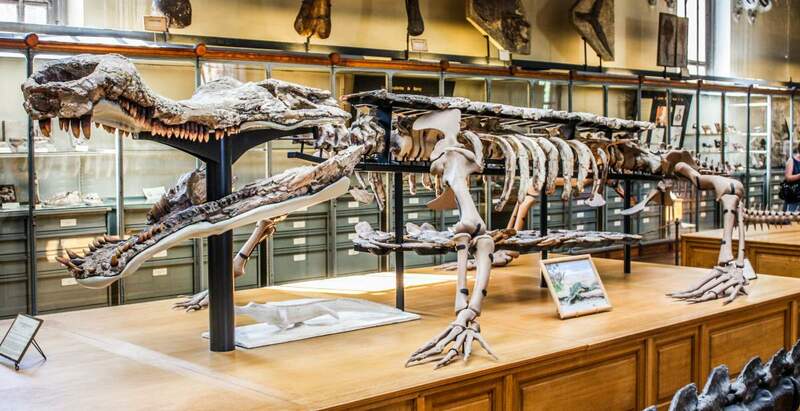 Most sources on the web claim that the Sarcosuchus imperator was the biggest crocodile ever lived, but as I said above, in fact it is still controversial. Sarcosuchus, popularly known as “supercroc” is an extinct genus of crocodyliform and distant relative of the crocodile that lived 112 million years ago. It dates from the early Cretaceous Period of what is now Africa and South America and is one of the largest crocodile-like reptiles that ever lived. It was almost twice as long as the modern saltwater crocodile and weighed up to 8 tonnes. 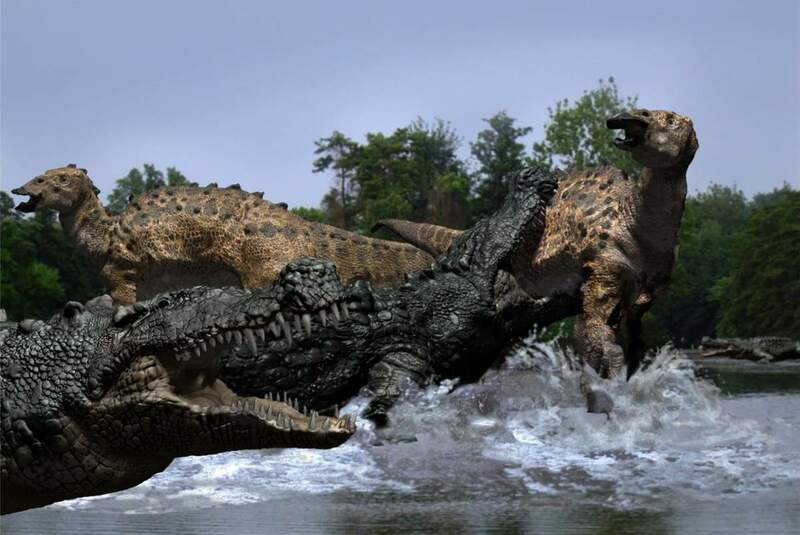 Like most crocodiles, Sarcosuchus had a huge biteforce, possibly up to 9 tons, more than 88,000 N, far exceeding any modern-day crocodile (16,460 N), and is one of the most powerful bite forces on Earth (even higher than the bite force of T-rex). Fish are easy prey for small crocodiles but as they grew larger they would need more sustenance to survive and so they may have begun to incorporate dinosaurs into their diets as well.‭ ‬As seen in crocodiles today,‭ ‬Sarcosuchus may have also left the water to scavenge the kills of the larger dinosaurs as well. Although it’s unlikely that Sarcosuchus deliberately hunted dinosaurs for lunch, there’s no reason it had to tolerate other predators that competed with it for limited resources. A full-grown SuperCroc would have been more than capable of breaking the neck of a large theropod, such as, say, the contemporary, fish-eating Spinosaurus, the biggest meat-eating dinosaur that ever lived. Sarcosuchus skull vs human vs modern crocodile. A Caiman is an alligatorid crocodilian belonging to the subfamily Caimaninae, one of two primary lineages within Alligatoridae, the other being alligators. Caimans inhabit Central and South America. They are relatively small crocodilians. Their body types were similar, but I think it is Rhamphosuchus. The source of the photo was also saying so. this article was very helpful. Thank you for writing and posting it! it helped settle a dispute among 3rd grade students in Osceola Mills, PA.
You’re welcome, Kim! Thanks for reading. I am glad it helped! Berarti buaya itu banyak sekali ya? dan besar-besar..
I’m thinking that Supercroc and Purrasuchus are tied until we find more evidence. Yeah… I also think that Sarcosuchus could eat dinosaurs. Can’t compete with Tyrannosaurus Rex’s bite force!?!?!?! T. Rex had a maximum bite force of 57,000N. That’s nowhere near the pressure of 88,000N! Furthermore…. where was the mighty Machimosaurus Rex??? Machimosaurus is said to be as large if not larger than Sarcosuchus Imperator. Also, what about Sarcosuchus Hartii??? Either this is an old article and you’ve done well to cover yourself or you didn’t look into your studies enough. You’re right, the estimated bite force of T-Rex is about 57,000N. One study for 2003 puts it as high as 183,000 to 235,000 Newtons but I think it’s an exaggeration. So I fixed the article. Yes, it is a bit an old article, but I don’t think the Machimosaurus Rex was bigger than Sarcosuchus. It is 30 feet long, shorter than Sarcosuchus. I couldn’t find the size information of Sarcosuchus hartti, can you provide a source, please?